This late 1960's Selectric 1 is on the way to NYC. I'm working on a Correcting Selectric 2. A lot of repairs are done through the bottom of the machine. I'm typecasting on my daughter's Royal Companion. Very nice video. Your warmth toward people and typewriters shines through. Beautiful typewriters and your good news fill this video. Bravo! 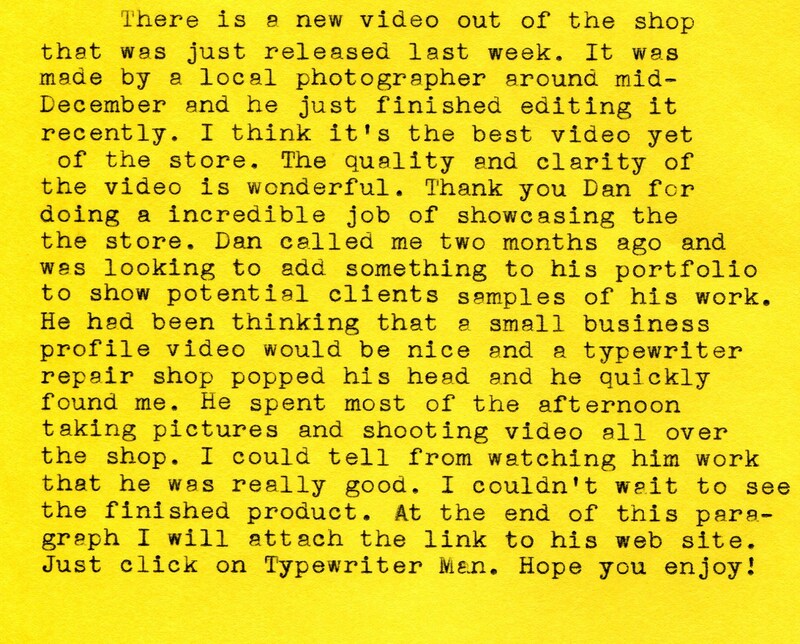 Great typewriter and an amazing video :) congratulations! Very excellent video and post. Thank you fro sharing. You really have some very beautiful typewriters! The last one matches one of mine, if I ever repair it. I hope I can get to visit. Richard- Thank you. Meeting customers is one of the best parts of my day. Well, that and bringing typewriters back to life. I dream lo-tech- Thanks for the generous comments. By the way, your last post was awesome. Fernando- Thanks for the nice comments. Glad you enjoyed. 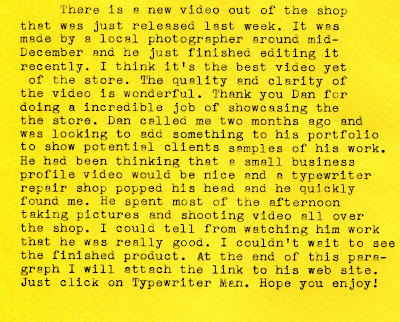 Bill- Glad you like the typewriters. I do hope you get to visit someday. I'm amazed at how far some people have traveled to visit. I treat them like visiting royalty. What a nicely-done video! It's a great addition to the Typosphere. You look and sound exactly the way I imagined, from your very positive and upbeat blog posts. It bears repeating that I am reassured to see you, and people like you, repairing the typewriters that we treasure so much.